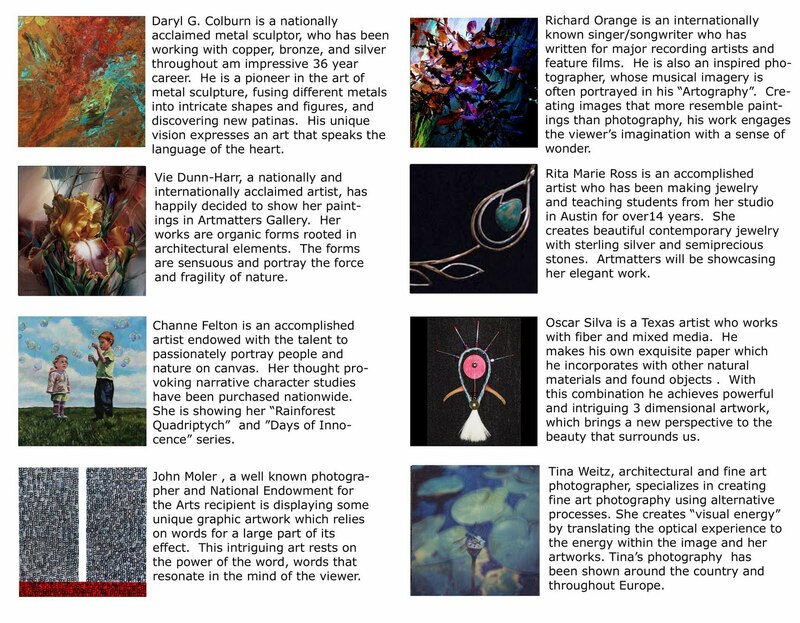 Texas Online Radio: Artmatters Gallery Grand Opening in Gruene, Texas ~ Works by Channe Felton along with other accomplished national and regional artists. 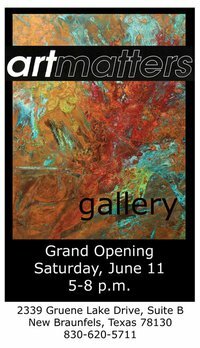 Artmatters Gallery Grand Opening in Gruene, Texas ~ Works by Channe Felton along with other accomplished national and regional artists. Artmatters Gallery is a new contemporary art gallery located in New Braunfels, Texas at Gruene Lake Village. The gallery will host accomplished national and regional artists, and showcase art in a variety of mediums in exhibits scheduled throughout the year. The participating artists in the opening exhibit are : Daryl G. Colburn, Vie Dunn-Harr, Channe Felton, John Moler, Richard Orange, Rita Marie Ross, Oscar Silva, and Tina Weitz. Please join us for the grand opening reception on Saturday, June 11 from 5 to 8 p.m., located at 2339 Gruene Lake Drive, Suite B.